It's upon request that I've decided to propose 8 spots for semi-private drawing classes. Each class will have a maximum of 4 students, so everyone can receive enough attention and support. 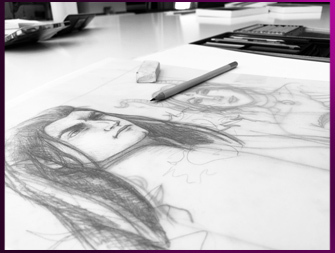 Both courses will address students of any level wishing to refresh, learn or experiment new drawing techniques in a positive and supportive environment. We're here to create and enjoy! A tailor-made concept will be determined to reach the goals of each student. Some may attend only for entertainment while others may be more serious. The first part of the 2 hour class will be explaining drawing techniques, and asking everyone to participate in the same exercises. The second part will allow more freedom, as every student will be able to work on a personal project that will reflect their own advancement. As for the required material, special drawing kits will be available for purchase at the workshop, or discussed on the first day of class. The classes are scheduled to start in early September 2018, every Mondays and Wednesdays. You can register directly on the website, send us an email for manual registration, or drop by the workshop. It will be a pleasure to meet you there. Of course, if you have any questions, feel free to contact us prior to registration.